After Amazon’s successful commercial drone delivery early this month, the company now has been granted a new patent to safeguard its flying drones. The patent named, ‘Countermeasures for threats to an uncrewed autonomous vehicle’ (UAVs) was filed by the company in November, 2014 which was published just last week. It is a 33 page long patent and includes all possible counterattacks and their respective drone-securing measures. Few of the possible situations include bad weather, crowded sky, a network jamming attack or being struck with a rock, gun or an arrow. These measures also include sensors attached to orient the drone based on the sun’s position in the sky in order to protect from lightning and flash. The patent also states a mesh network to check data sources and satellite signals for verifying reading the drones are following. If the readings don’t match from all the sources, the drone will go with the majority vote. The fail-safe module terminates the navigation to the first computing device, and the fail-safe module directs the UAV towards the ground. In some implementations, the fail-safe module may be configured to direct the UAV to take evasive maneuvers, navigate to a safe landing or parking zone for inspect, and so forth. Further, the drone would be able to send its location data as an alert in case it gets lost. The drone may also deploy a protective device such as an airbag, foam, parachute, bumper or shift into a mode such as configuring auto-rotation of one or more rotors depending upon the circumstances it faces. Further, Amazon has also developed electronic systems to detect signal jammers and other hacking attacks. Though Amazon has not yet detailed which of these patented measures it would be using with its drones, the said patents will surely eliminate ill acts, inadvertent system failures and hence result in seamless prime deliveries. Comcast customers who use a lot of bandwidth will need to start keeping an eye on their data usage. Starting November 1, Comcast is rolling out a one terabyte data cap in 18 new markets, including Washington. This applies to all home customers, regardless of the speed of your plan. Customers who go over the data limit will be charged $10 per 50 gigabyte data block (up to $200). Comcast is also offering an unlimited data plan for an additional $50 per month. You will be able to track data usage online and sign up for notifications. Comcast claims 99-percent of customers use less than 1 TB per month, but it could be an issue for fans of online gaming or 4K streaming. The data cap is already active in parts of 16 states. On November 1, Comcast will add 18 new markets including Washington, Oregon, Idaho, Colorado, California, Minnesota, Texas (Houston), parts of Florida, southeastern Georgia, parts of Michigan and Western Ohio. You can find a full list of markets here. You can learn more about the Comcast changes on its FAQ page. The only thing worse than sitting through a boring or obnoxious speech is being the poor soul who just gave it. Whether it’s wedding toasts or the too-early start of the 2016 election season, every time you turn around somebody is standing up to share a few remarks. Some are brilliant and inspiring. Others, not so much. I know a bit about how to give a great speech–and probably more importantly, how to avoid giving a really bad one. I’ve had a side business as a professional ghostwriter for years, and I also run a network that connects other freelance ghostwriters with paying clients. While I’ve written more articles and books than I could possibly count, it’s the speeches–everything from eulogies and father-of-the-bride speeches to professional presentations–that can be most daunting. I think this is because speeches are a multifaceted form of communication, most often given in real time, and that means there are simply more ways to screw thing up. So, in the interest of improving your next audience’s experience, here are 10 key steps that you absolutely must take to avoid a crowd full of groaners and yawners–or worse. Too basic? Please. We all have a story about the wedding toast that was completely inappropriate, or the professional address that got way too personal, or the supposedly friendly speech that turned into a complete bummer. Understanding the occasion and getting the tone right are crucial. People mess this up all the time, and yet it’s so easy. Think about your audience. What are they expecting to hear? 2. Take the time to prepare. 3. Structure is your friend. Make me listen to a horrible speech, and I bet I’ll tell you afterward that it lacked structure. Think of it this way–if the audience doesn’t know where the speaker is going and how long he or she is going to take to get there, they’re less likely to be on the his or her side.. We’ve all sat through these kind of long, boring diatribes. At the very least, even if you get everything else on this list wrong, at least respect your audience enough to let them know how long the torture is going to last. 4. Sing, don’t just speak. You don’t have to rhyme your words or look up what iambic pentameter means, but remember to write prose with a dash of poetry. Here are two simple tips to make it easy. First, boil the theme of your speech down to a simple phrase, and repeat it at well-spaced intervals (classic example: “I have a dream…“). Second, remember that the human brain is hardwired to respond better to three-item lists. I don’t know for sure, but I’d bet that’s why in his classic 2005 speech at Stanford University, Steve Jobs mapped out his speech and told his audience he planned to share three stories. 5. Get the logistics right. Basic stuff: Don’t read your speech verbatim, but have your notes with you. Project your voice–and if that isn’t going to work, make sure you’ve got a working microphone or plan to speak from the center of the crowd. If you’re physically short, stand on top of something. And at the risk of being crass, look in the mirror. Make sure your hair isn’t standing on end and you don’t have any boogers hanging out of your nose. Don’t let practical things that have nothing to do with your speech ruin everything. Don’t over-rely on them, but use them as tools to “prop” up your speech (hence, “literally”). Also, if you absolutely have to use PowerPoint–you probably don’t, but if you really do have to–the fewer words on each slide, the better. Oh, and plan for the worst. Assume the projector will break, or your computer will freak out. What’s your backup plan? Even though you’re doing most of the talking, a good speech is ideally a multi-way communication between you and multiple audience members. That’s actually a pretty high standard, but aim for it, and when things are going wrong, fall back on it. Focus at least on finding one or two friendly faces in the crowd, and engage them–whether it’s through simple nonverbal communication, questions, or something else. 10. Pretend you’re on an airplane. Know where the exits are. Even when you’ve prepared perfectly, sometimes a speech just doesn’t go well. Sometimes you run out of time (maybe it’s not even your fault), and sometimes you just plain lose the audience. So, prepare for it, by building escape hatches into your remarks. Know how you can cut them on the fly without seeming like you just quit in the middle. I guarantee you that at least once in your speaking career, both you and your audience will be glad you did. IDC attributes the rapid growth to a combination of new vendors, new devices, and greater end-user awareness. 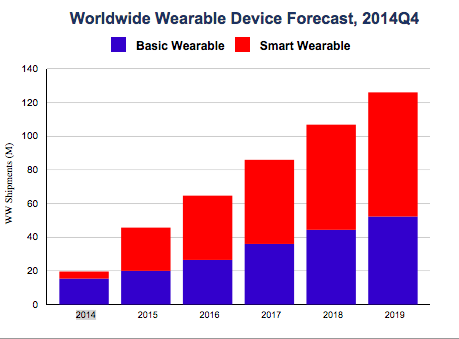 “Smart wearables,” that is, wearables capable of running apps will fuel the growth of the space. These devices include the Apple Watch, Motorola’s 360 smartwatch, and the Samsung Gear watches. Such smart wearables sold about 4.2 million of such smart wearables sold in 2014, but IDC expects that number to rocket up to 25.7 million units this year. Dumber wearables, like basic fitness trackers that don’t run apps, IDC says, will grow from sales of 15.4 million units in 2014 to 20 million units in 2015. “Smart wearables are about to take a major step forward with the launch of the Apple Watch this year,” said IDC analyst Ramon Llamas. “The Apple Watch raises the profile of wearables in general and there are many vendors and devices that are eager to share the spotlight. When a child is missing, one second could mean everything. Waze scans the national AMBER alert system every 10 minutes to determine if there is an active missing child alert in the area where the user is located. If there is, the driver in the respective area will see a specially designated icon on the map. But the message will only appear after the car has been stopped for at least 10 seconds in order to keep drivers from becoming distracted and it will disappear if and when the vehicle starts moving again. Further, users of the app will see the same alert only once a week. The blog post in which Waze announced the new feature says it will use all of the information that is available on missing children, such as the model, make and license plate of a vehicle believed to be transporting them. A separate screen will give users the option of seeing “more information,” such as the child’s age, gender, ethnicity, height, weight and a brief description. According to the NCMEC, the AMBER alert system is a voluntary partnership between law-enforcement agencies, broadcasters, transportation agencies and the wireless industry to send widespread, urgent messages to assist in the search for and rescue of children involved in the most serious abduction cases. As of the time this article was published, AMBER alerts had helped to recover 734 missing children since it was introduced in 1996. It’s named after 9-year-old Amber Hagerman who was abducted while riding her bike in Arlington, Texas, and later found murdered. According to AMBERalert.gov, notifications are already automatically sent to millions of cellphones using the Wireless Emergency Alerts system.